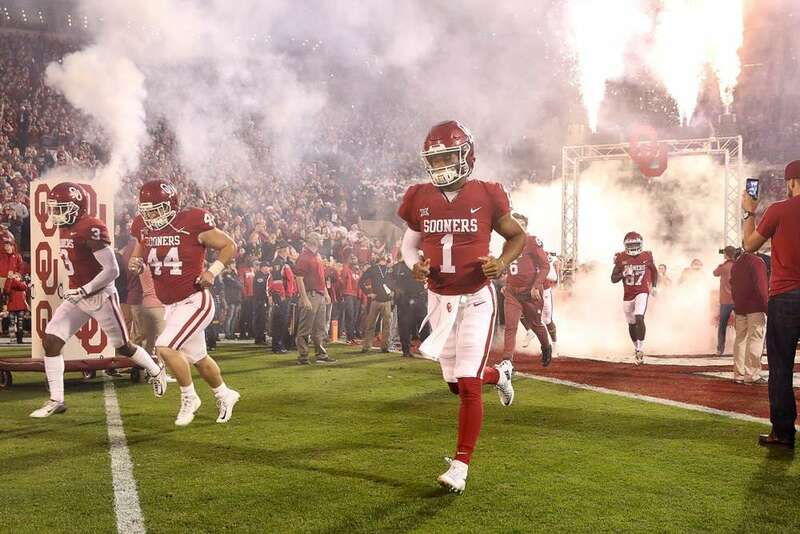 There are always surprises and stunners in the NFL Draft, but it may be an absolute shock if the Cardinals do not take Kyler Murray with their first overall selection later this month. New head coach Kliff Kingsbury has openly praised him in the past, and now is his chance to land one of the most unique prospects at the position we have ever seen. The QB position has evolved to the point where dual threats as passers and runners are widespread, and Russell Wilson has challenged the notion that an elite QB must be very tall. Drew Brees was the first significant passer to shatter the myth, but Wilson’s success has possibly ushered in a new model of QB that points to Murray officially changing the way the position is viewed. Here comes a rookie passer with a dynamic skill set as both a runner and passer, and he is even shorter than Wilson. Murray is officially listed as an inch shorter than Wilson, but that may be a generous understatement. Wilson regularly plays from under center, yet most scouts believe Murray will have to enter the NFL as a pure shotgun passer. The skill set cannot be questioned. Like Wilson, he throws very pretty deep balls and works well on play action passes. He also makes the high percentage throw very frequently with good accuracy. What Kyler Murray means in Arizona? Kingsbury is expected to bring a vertical game to Arizona, at least to those who have watched him at the college level in the past. But he really does not have the personnel to ideally execute the same attack he did at USC. Good head coaches and coordinators will tailor their systems to the talents they have on hand, rather than forcing their schemes onto personnel that may not quite be the right fit. Where does David Johnson fit? Much as Wilson benefitted from playing with Marshawn Lynch in Seattle’s most successful season, Murray has the immediate advantage of playing with a top RB, David Johnson. The Cardinals’ feature back is an instant gift to Kingsbury and Murray, especially with his receiving skills as an added plus. It’s important to have a strong running back to support any first-year QB, and Johnson does have some experience working out of the shotgun. According to PlayerProfiler.com, he carried out of shotgun 22.9 percent of the time last year and averaged 4.0 yards per carry. Operating more frequently out of the shotgun would be an obvious adjustment for Johnson, and that clouds his outlook a bit to the point where he probably won’t be considered among the top fantasy RBs heading into 2019. Of course, his production from last year merits a less optimistic outlook from some fantasy owners. The offense should certainly be better with Kingsbury and Murray playing such new and significant roles, but it cannot push Johnson back into his past place among RB1s. Johnson’s current Expert Consensus Rank on FantasyPros.com is No. 10 at running back in PPR formats. That seems very fair, as he is ranked just behind the likes of James Conner and Joe Mixon and ahead of guys who are bigger question marks such as Dalvin Cook and Leonard Fournette. We should be expecting the Cardinals offense to be improved, but Johnson’s duties will be somewhat unclear. How much will the rookie QB throw to him out of the backfield and how will working out of the shotgun more often affect Johnson overall? Of course, there can also be more RPO possibilities with Murray as the QB. If the offense is better under Murray’s direction, there should also be a very healthy amount of scoring chances for Johnson. Who’s gonna catch the ball? Murray is a very effective downfield thrower, and Kingsbury comes from a background of showcasing offenses with a high emphasis on the passing game. But Murray’s most established pass catcher, Larry Fitzgerald, is not much of a deep threat anymore. The future Hall of Famer can still catch 75-plus passes and be a threat in the red zone and a great safety valve for the new QB. Fitzgerald will ensure that Murray has a dependable target to move the chains with, but he is not going to help him make the bigger splash plays. So second-year WR Christian Kirk will have to be the one to step forward and become Murray’s favored target, as there just is not much else on the depth chart to speak of. He averaged just under 14 yards a catch last year and does have some big-play potential. Kirk has some intriguing fantasy upside for 2019 and beyond. He could instantly become Murray’s favored and go-to target and he may morph quickly into a very promising fantasy starter this upcoming season. Fitzgerald will still command a lot of defensive attention, and Johnson can help keep safeties honest and focusing on the offensive backfield. Downfield strikes to Kirk off play action and RPOs could become quick signatures of the Arizona offense in 2019. Murray and Kirk played together briefly at Texas A &M, and there is a limited amount of familiarity between them that can only help accelerate a developing rapport. We will have to wait and see in the preseason if Murray establishes a rhythm with anyone else besides Fitzgerald and Kirk. TE Ricky Seals-Jones was a major disappointment in 2018, yet with Murray boosting the offense, he could become more of a frequent TD threat and option on key passing downs. I would certainly monitor the progress of Seals-Jones as he works with Murray, as the physical tools are there for the TE to be productive with an improved QB outlook. With Murray likely to land in Arizona, that obviously means Josh Rosen will be bought a ticket out to join a QB-needy team around NFL Draft time. The Giants and Washington have frequently been mentioned as prime suitors. Landing in New York could instantly improve the outlook of Rosen from a fantasy perspective, as he will have one of the top superstar RBs in the game who can also be a terrific receiver for him. Golden Tate would serve as an ultimate prime target for a young QB, as he can make frequent possession receptions and also gain yardage after the catch. Evan Engram will be a prime target often as well, and Sterling Shepard offers fine receiving depth as well. His dynasty value would get a significant boost in such a scenario. Being moved to a destination such as Washington or Miami would only mean more struggles for Rosen as we saw in his rookie campaign. A brighter future in Arizona is nearly upon us, both in the short and long terms, as the NFL Draft approaches. Fantasy players in all formats should be ready to see new sparks fly in all formats.